Snow will fall over all mountains between Friday afternoon and Sunday, with the heaviest amounts in the southern mountains. 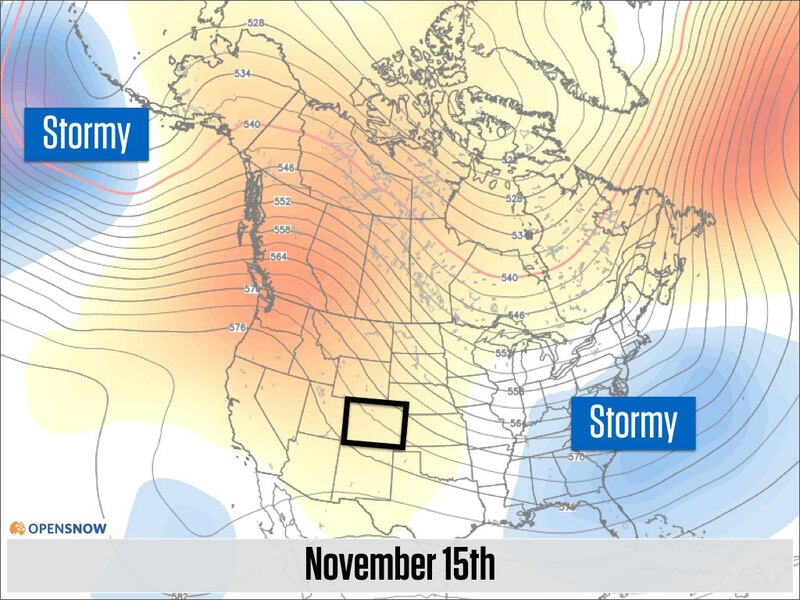 The weather for next week will be benign, but then a change to stormier weather is likely during the last 10 days of November. Before getting to the forecast, let’s look at where we are right now. Precipitation compared to the average from October 1 to November 4. 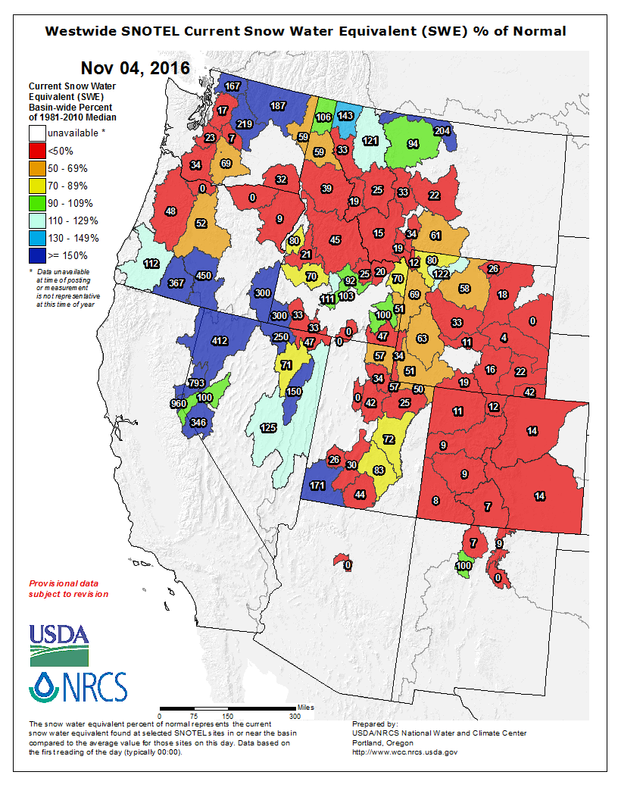 Northwest is best with 200+ % of average precipitation, while Colorado is drier than average with 20-70% of average precipitation. For current snowpack, the picture is not as clear. 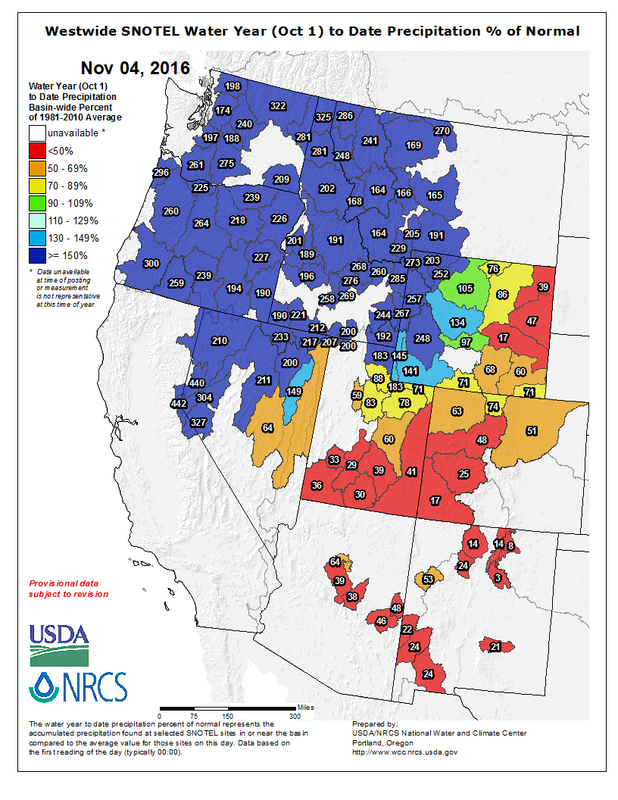 While many areas to the west and north of Colorado have seen a lot of precipitation, the recent spell of warmer temperatures has melted some of the snow and/or kept snow levels high. In Colorado, snowpack is meager … just about 10% of average, or really, just a few patches of snow at higher elevation, north-facing slopes. Our next storm is spinning over Arizona on Friday, and you can see that it is producing a decent amount of rain in Arizona and New Mexico. This storm will slowly move toward Colorado and will affect our weather through the weekend. For the southern mountains, expect rain and snow showers to begin on Friday afternoon and continue through Saturday. Elevations over 10,000 feet should see 3-6 inches. For the central and northern mountains, the best chance of precipitation will occur between midday Saturday and Sunday morning. These mountains may see 1-3 inches over 10,000 feet. The snow level will fluctuate, lowering to 9,000-10,000 feet during the night and during times of heavier precipitation. The snow will rise to 10,000-11,000 feet during the day and during times of light precipitation. Last note about this storm … slow-moving systems usually introduce more potential for surprises. When storms move slowly, bands of heavier precipitation can linger over one area, causing more snow than forecast, and can miss other areas, causing less snow than the forecast. The main message is that the southern mountains should get the most snow, but most peaks should get at least a couple of inches. How is snowmaking coming along? A little bit better. Thursday night’s cool temperatures AND dry air helped many mountains fire up the snow guns. Temperatures through the weekend and most of next week will be borderline for snowmaking. When there is more moisture in the air this weekend, snowmaking may be limited or not occur. When there is less moisture in the air next week, conditions will be better. Next week, from Monday November 7th through Friday November 11th, most of the state will stay dry. I think. The storm that will affect us this weekend will basically double back and hang out close to Colorado for most of next week. Right now it doesn’t look that we’ll get much if any precipitation, but a few showers aren’t out of the question. Also, because the storm will be close by, temperatures will be cool enough that snowmaking could continue most nights. It’ll be close, but temps should be cool enough for this. Looking further ahead, I have good news. Starting our outlook on November 10th, most of the Rockies, including Colorado, will be drier and warmer than average. That’s the red colors. The drier and warmer pattern will continue through at least November 15th, ish, but notice that things are changing a bit. And by November 20th, the red colors are gone and the white and blue colors return. That signals the likelihood for cooler and potentially stormier weather. 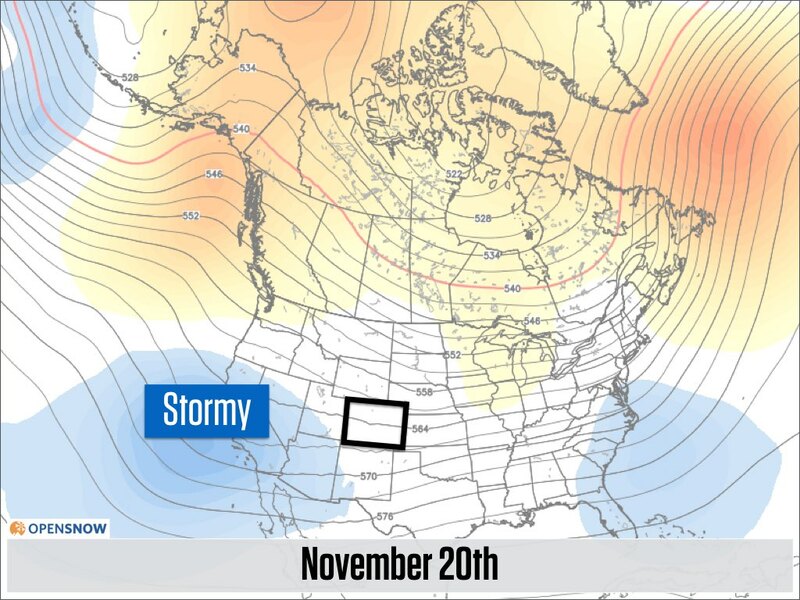 The above forecast is NOT a guarantee that we’ll suddenly get snow and cold air on November 20th. 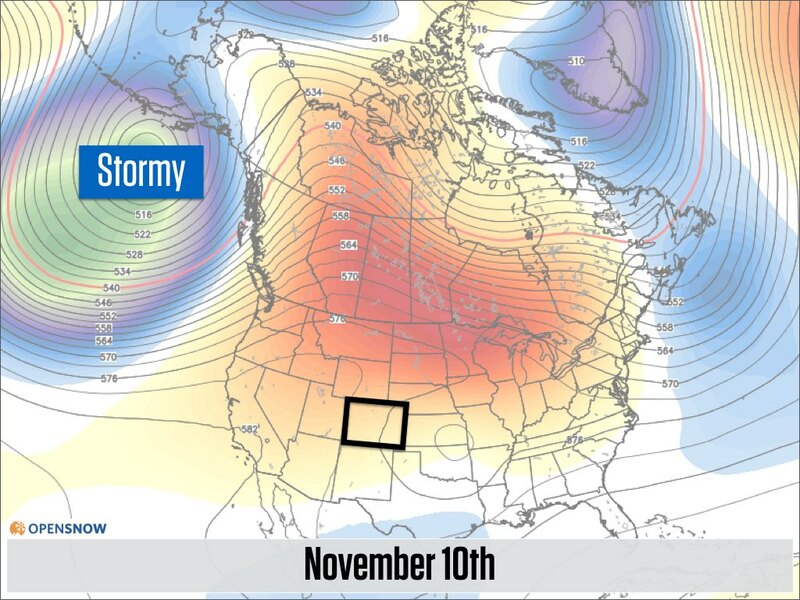 But, it IS a strong signal that our warm and dry weather pattern should transition to a potentially stormier pattern during the final 10 days of November. The three maps above are from the American GFS model ensemble, which is a collection of 21 models, all run separately, and then averaged. It is NOT wise to pick one model when looking at a forecast, especially a 10-15 day forecast. Instead, when an average of many models signals a pattern change, this gives us some hope that the models aren’t “out to lunch” and instead are showing a forecast that may actually come true. 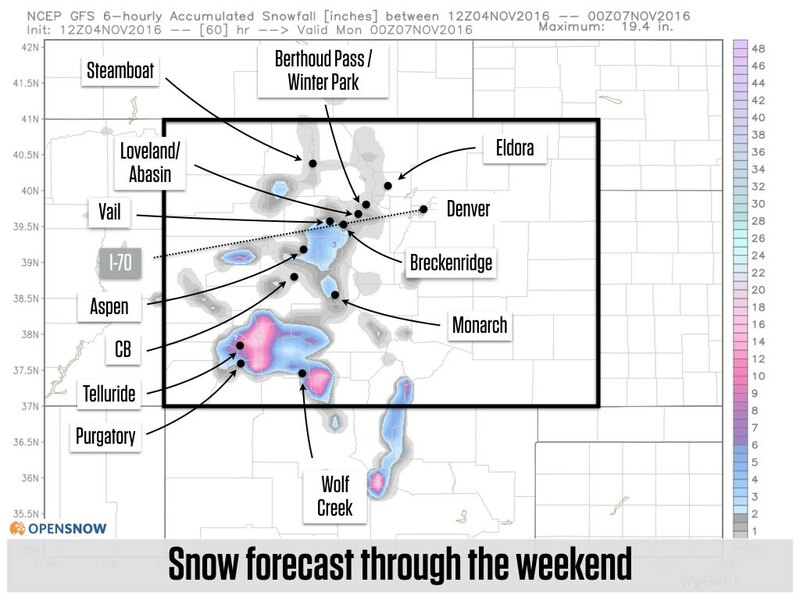 I used to have a Facebook page called “Colorado Powder Forecast”. Back in the good ol’ days, yeah? I decided the bring it back and updated the name to “Colorado Daily Snow”. Maybe this will make it snow again:-) Follow at https://www.facebook.com/coloradodailysnow or search Facebook for “Colorado Daily Snow”. Also, you can follow me personally on Twitter @gratzo and on Instagram @gratzo.